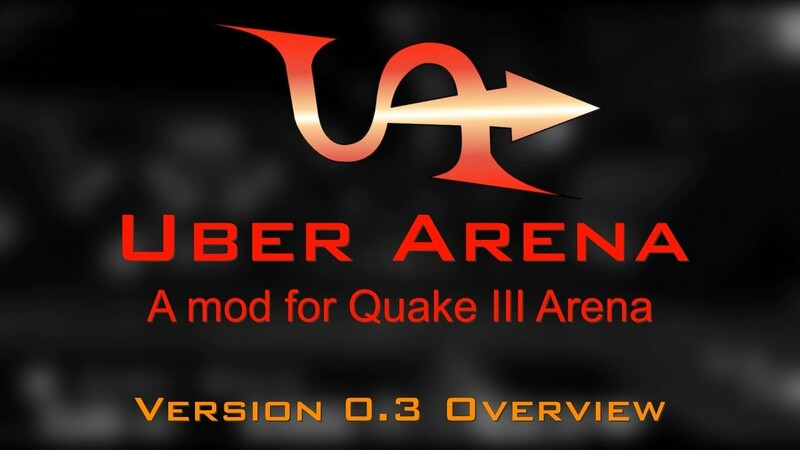 Uber Arena is a mod that takes the standard gameplay of Quake 3 and attempts to build upon and revitalize it with new gameplay mechanics and items. It has NO loadouts, NO abilities, NO champions, NO item timers, NO mechanics that use random number generators, and NO on-spawn inequality. All mechanics were designed around Quake's core principles such as on-spawn equality, item control, positioning, and movement, with the intention of enhancing these critical gameplay elements and introducing more skill without undermining the foundations of the game itself. In the end, the goal is to demonstrate how the arena FPS genre can be refreshed and innovated in ways that are more faithful to the base ideas of arena FPS in general, as opposed to Quake Champions which has proven to be highly controversial amongst the playerbase. I don't have anything really against the direction being taken with the gameplay of QC - I think the idea behind it is awesome and worth pursuing (though there's certainly a lot of balance issues that could be addressed), but I can also totally understand why people may not care for it, since it is a much more drastic change that radically redefines one of Quake's main pillars, which is on-spawn equality. Since I know this is primarily an original Quake / QuakeWorld-focused forum, I'll go ahead and mention that if there is enough interest in it, I may decide to create a QuakeWorld version of Uber Arena. Uberweapons (trademark mechanic): Upgraded versions of the standard Quake 3 arsenal, which can be obtained by obtaining 3 weapons of the same type. Reinforces item control and places emphasis on weapon control over traditional health / armor control. Provides an alternative means for the out-of-control player to regain control of the map apart from just controlling armors, while still punishing poor decision-making. Item Knockback: Items can now recieve knockback from splash damage weapons like players can. Use to deny items from other players or move out-of-reach items toward you, creating a whole new dimension of gameplay that's well-suited for competitive Quake and feels right at home / non-gimmicky since it simply extends an existing game mechanic (knockback) and applies it to another existing element (items). Weapon limits and weapon pouches: Players can collect up to one non-starter weapon upon spawn, but must collect items called weapon pouches to make room for new non-starter weapons. Encourages more thinking about what weapons to pickup as opposed to just grabbing everything that comes by, as well as by making players decide between more weapon diversity or waiting to pickup 3 weapons for an uberweapon (instant gratification vs. delayed but bigger reward). Weapon pouch models are modified versions of a model by Victor"DaEngineer" Karp. Reduced starting ammo: Encouraging more conservative use of weaponry, as opposed to the very generous amount of ammo usually given to players in standard Quake 3. Super Ammo Crate: Ever wondered why the Mega Health and the Red Armor don't have an equivalent-level item for ammo? Wonder no more. Trampolines: Latticework surfaces that act like jump pads and accel pads, but reflect velocity instead of pushing the player in a specific direction and speed, making them much more flexible. Similar to Portal 2's repulsion gel, but with no initial minimum boost. 8 maps based on older maps from both id software and highly acclaimed Quake 3 community mappers like Matthew "Lunaran" Breit, Tigger-On, Dmitry "Vondur" Svetlichny, Joel "wviperw" McDonald, Benoit "Bal" Stordeur, and Tim "spirit" Schäfer, with new routes and the implementation of Uber Arena items and trampolines. All community maps are used with credit and full permission from the original authors. Click here to view the Uber Arena documentation for more information.